As the sibling of someone with special needs, it is common to feel overlooked within your own family. However, if you choose to consciously and deliberately re-shape your focus, instead of lamenting about the ways things should be, you will come to learn what you are truly made of. You are not a typical sibling; you are a parent-sibling hybrid. As a result, you are on the fast track when it comes to psychosocial and spiritual development. While your peers are busy being children and adolescents, you will always carry a greater responsibility. At times, you may even envy other children’s carelessness. Be that as it may, if you refocus your mindset, be more compassionate and press on, the additional weight that you carry will only give you very broad shoulders. You come to know the many shades of complex grief at a very young age. Always commit to allowing love and compassion in to irrigate these wounds, knowing that at first it stings, but it is the only way to truly heal. Remember that you aren’t alone. Considering your role as caretaker, the last thing you are comfortable with is allowing others to help, but there are many people who can relate. You will find the discovery of common ground and sharing of experiences to be of great comfort on this journey. You are an artisanal blend of grit and compassion. This is rare, sparkly and intense. Use this power wisely. You are sharply tuned in to the needs of your special needs sibling. Your radar is set to pick up on the frequency of ignorance and to protect your sibling from the unfairness in this world. As a result, this love and protective instinct extends beyond your sibling to also include those who are marginalized, without a voice or in need. This compassion is an asset. Your bond with your special needs sibling is beyond anything you will experience with anyone. Period. You are the translator, the protector, the caretaker, the nurse, the clown, the best friend and more. Exhausting? You have it in you. Trust me. Nevertheless, your heart breaks every day. It breaks because it wasn’t you and because you cannot fix it, even if you know that nothing needs fixing. When you see someone who is like your sibling, you burst with joy and then your heart breaks for them and everyone like them. At each milestone in your own development — your victories, celebrations and graduations — you will inevitably feel as if you are leaving your sibling behind a bit further. This is when that complex grief taps you on the shoulder to let you know that it is still there, standing on the edge of the dance floor, reminding you that in the silence of the evening’s end it will follow you home. If you can hold its hand, instead of running from it, it becomes a less daunting companion. Your sibling has given you so many gifts: patience, compassion, awareness, mindfulness, a sense of humor and a greater capacity for love. Some people search their entire lives for such richness and depth in a relationship. Some never find it in this life. Your sibling will teach you so much if you slow down to watch and listen closely. Remember to keep your heart open. We never learn to love more deeply from experiences that are easy, and loving more deeply is what it is all about. 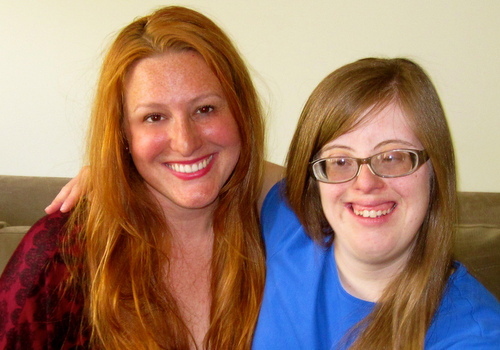 Jilly Appleheimer is a visual artist, writer and the author of “Kristen Grows Up,” a book for young women with special needs, which was inspired by her sister who has Down syndrome.